Kids playing by the train in the film KILLER OF SHEEP; a Milestone Film & Video release. This working paper will appear in Black Camera: An International Journal, 9.1, Indiana University Press, Fall 2017. Killer of Sheep opens on a black screen with the a cappella voices of a mother and child singing a lullaby. The song fades into a disorienting close-up of an angry black man yelling at his teen-aged son, “Boy, I’ll beat you to death.” Sweaty and sick in his undershirt, the father coughs his way out of the frame and then returns to say, “You are not a child any more. You soon will be a goddamn man. Now start learning what life is about now, son.” The boy’s mother silently watches this scene, walks over, and slaps her son hard in the face without a word. Fade to black and the great Paul Robeson sings his baritone version of the same lullaby. 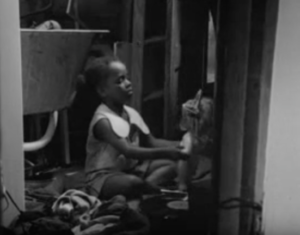 Here, in this two-minute introduction, Burnett prepares his viewers for his slice-of-life portrait of a black family living in Watts, California, in the early 1970s. The main characters – Stan, now a full-grown man, his unnamed wife, five-year old daughter, Angela, and teen-aged son Stan Jr. – move through a non-linear narrative of loosely connected vignettes that pull the viewer inside their world. Their neighborhood looks like a bombed-out refugee camp. We hear strains of music, “The children in the playground…. that’s America to me.” Chaotic scenes of children running away, fighting, stoning each other, plotting, watching, and waiting, are mirrored by the activities of their adult counterparts. The children have energy. The adults do not. The film is constructed like a blues song. Visual refrains run through the scenes, themes of sadness and happiness intertwine, and nothing much happens. The daughter repeats the dressing ritual of her mother; Stan’s white undershirt references his father’s; Stan Jr.’s treatment of Angela echoes his father’s neglect of a younger sibling; the wife lays her hand on Stan’s arm in the same way that a white woman storekeeper signals her interest. Stan’s wife checks her make-up in the reflection of a cooking pot lid, then the bathroom mirror. Her seductive slow dance with Stan mirrors his sensual love for her – recalled through the touch of a warm teacup on his cheek. Boys hurling rocks re-enact the Watts riots of 1965. The gender wars are savage. Asked who makes the rain, Stan jokes, “It’s the Devil beating his wife.” Stan Jr. squeezes his little sister’s face until she cries. Dancing, singing girls in the street attack an aggressive boy on a bike. The girl who kicks the bicycle-boy is a younger version of the woman who kicks a lascivious “dirty old dog” with a bandaged head. Everyone is injured and everyone is watchful. Stan’s wife stares out enigmatically through a screen door; her daughter’s haunting sad-clown face presses against the glass of a truck window. Watchful women and girls hang back, on fences, porches, and stairs, image after image. The most disturbing “watching” image is that of little Angela inside a grotesque Snoopy-like head-mask, swinging by one arm from a chain-link fence, sucking her thumb, and staring from large, expressive, knowing, cartoony eyes. A dandy peeps around a pillar ready to dodge thrown objects, just like the young teen who peeps around a wooden shield protecting himself from rocks. Three bored boys stand on their heads on a front porch, counting. As the camera pulls back, the image references the slaughtered sheep at Stan’s workplace, hanging upside down from hooks. Imminent danger is everywhere, creating a sense of dread and apprehension in the film viewer: skateboarders narrowly miss cars; children fly from rooftop to rooftop like birds; three kids on a bike spill to the ground near the front of a moving car; a boy lies under a stopped train with his neck on a rail while his friends try to push the train’s wheels. Nothing happens. All is in static limbo. Scenes of hard work, frustrated goals, and Sisyphean futility repeat themselves: the anticipated great American road trip, symbol of freedom, ruined by a flat tire; the girl in the old-fashioned white dress hanging freshly washed laundry, only to have it spitefully soiled by a dirt-throwing boy; the impossibly heavy car engine, symbol of American prosperity and capitalism, lugged down the stairs and into a truck, only to be smashed to the ground minutes later. Comedic elements, reminiscent of Abbot and Costello, lighten the weight of some of the scenes but not by much. The film is like an episodic dream/nightmare: meaning is everywhere and nowhere. Children singing the counting song, “This Old Man,” introduce us to gruesome scenes in the slaughterhouse. We think, right – “this old man came rolling home” after a hard day’s work but we are also reminded that the song references the African American musical tradition of “playing the bones,” specifically sheep bones. And “knick-knack, paddywack, give a dog a bone”? Paddywack is another name for the ligament in the neck of sheep that supports their heads; dried paddywack is commonly sold as a dog treat. The film is all mood and tone, disjointed tensions, part of a larger story that we can’t quite grasp. The key to fully experiencing this film is in the soundtrack. The counterpointing of seemingly incongruous music with certain scenes does not directly argue with these scenes as we might think. Its purpose is to throw us off kilter, to force us to absorb different overlapping ideas in different rhythms and blend these ideas into something larger. Burnett does not impose his ideas on us; he leaves it to individual viewers to take or leave what resonates for them. By layering in traditional folk, blues, ragtime, jazz, rhythm & blues, and bluesy rock, Burnett creates an orchestral effect that confounds our experience of these real individual lives in Watts and situates them in the larger historical context of America. The effect is bitter and ironic. Adding another dimension to the dynamic between the music and the film, Stan’s daughter plays with her white doll while singing to a contemporary song on the radio, “Reasons.” The layering chorus to “Reasons” echoes the lullaby with “lalalalala lalalalala,” while little Angela holds up her doll and sings along to the words, “kissing and hugging and holding you tight.” The song’s lines, “the reasons that we fear, our feelings won’t disappear,” and “all our illusions were just a parade” foreshadow the crushing disappointment that Angela’s mother will experience that evening when Stan is too numb to return her sensual advances. As the song plays from the radio, Angela and her mother exchange sympathetic looks; the tenderness in their smiles lights up the room. The song, as Burnett’s contemporaries know, repeats several times, “All our reasons were a lie.” This mix of music and image gives the viewer an inkling that something might be wrong beneath the surface, and it might be more than Stan’s marriage that is troubled. Stan also doesn’t steal, murder, fight, deal drugs, or hurt others. He does not fit negative stereotypes of black manhood. He is not a rebel. He is the quintessentially good man whom his wife so eloquently describes in her tirade against his friends, Smoke and Scooter. “You wanta be a man and stand up? Don’t you know there’s more to it than just your fists? the scars on your mug?” She has hope and she nostalgically caresses her hope on the surface of a baby shoe. The gesture recalls Dudley Randall’s “Ballad of Birmingham” (1966) in which he commemorates the racially motivated 1963 bombing of an Alabama church that killed four choirgirls. That poem ends with the lines, “Oh, here’s the shoe my baby wore/ But, baby, where are you?” The lame girl who announces her pregnancy brings a bright smile to everyone’s face. Angela tells her sick friend, “fall behind,” reminding her that school is important. The system is pinched, damaged, thin as a dime, tinkly as the canned “Yankee Doodle Dandy” playing from the ice-cream truck in one street scene, but Stan believes in it. The man whose TV is stolen believes in it. The women still believe. But they cannot hear the soundtrack that we hear. 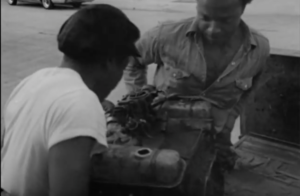 Burnett attempts through that soundtrack to recapture the aspirations of Second Migration workers who came to Los Angeles from the South during the Second World War, but set against the backdrop of the Watts Rebellion, his own film sabotages his positive intentions. Thirty years later, he believed he had documented “an age of innocence,” but, in fact, he had recorded its end. In spite of Burnett’s intent, Killer of Sheep reveals a traumatized population and a new generation doomed to repeat the violence of 1965. The Watts Rebellion had culminated in the unleashing of over fourteen thousand National Guardsmen on black citizens and resulted in thirty-four deaths, nine hundred injuries, thousands of arrests, a hundred square blocks destroyed by fire, and tens of millions of dollars in destroyed property. 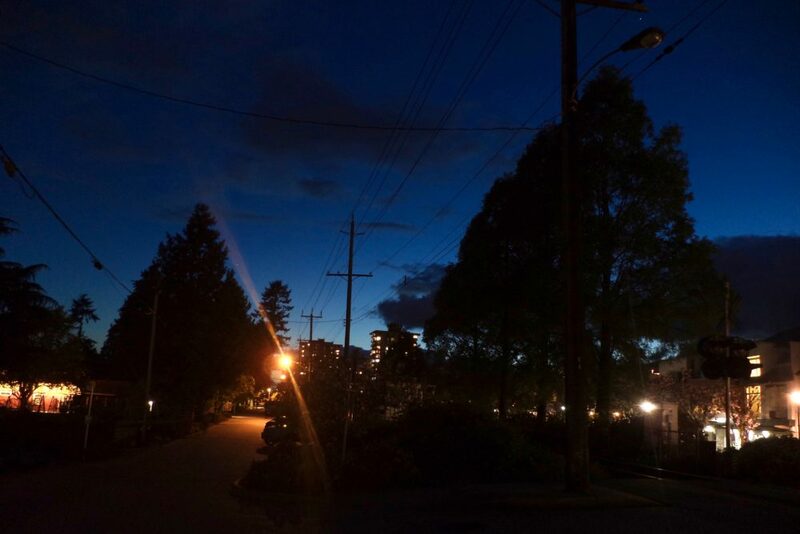 Although Burnett acknowledges the broken promise of democracy through his soundtrack, nowhere in the film does he admit the patterns of white supremacy, systemic poverty, and police violence that destroyed his beloved neighborhood. That absence represents a kind of silence reminiscent of earlier uplift literature and the collective need to forget. 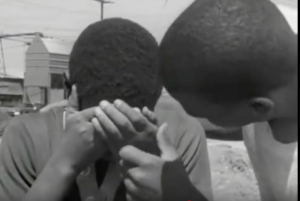 Viewers of Killer of Sheep are pulled inside the tragedy of urban African American experience but they are not released after the closing credits. The film subverts our expectations of catharsis and leaves viewers feeling soaked in despair, enervated, and unable to resolve feelings of discomfort. The moving strains of Dvorak’s music remain with us long afterwards, as do the words of “Going Home,” a hymn often sung at funerals. This home, in contrast to “The House I Live in,” is a metaphor for death, the long awaited release from human suffering. We carry images of the wreckage, the aftermath, what was lost, what seems no longer possible. We are witnesses to death and dying, on the slaughterhouse floor and in the muffled existence of these survivors of soul murder. 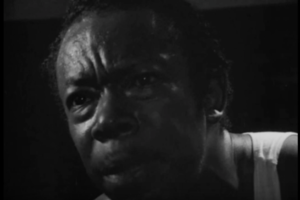 This entry was posted in Uncategorized and tagged African American film, Black Camera, black film studies, Black Lives Matter, BLM, Charles Burnett, film review, Killer of Sheep, Mary Maillard, Watts by Keith. Bookmark the permalink.